The digital renaissance is creating assets with an unstoppable momentum. The innumerable textual content, images and multimedia in the media vertical seem to jostle for space and attention. The need to organize this deluge of digital information is of crucial importance for today’s marketer. This is where the Content Management System (CMS) takes stock of the tangible assets and stores and tracks them. In marketing, analytics on this tracking of data generate usable results to further enhance better customized strategies targeted for a region, a language and much more. With CMS taking over, the digital journey of assets is being mapped with the customer in mind. From websites to search engines, the evolution cycle has moved enterprises on to master social media channels and CMS assists in developing a sound online marketing strategy for improving social media ROI. From its rich repository of assets, CMS saves on time to market by reusing and repurposing data, tracks the data as it flows through customized workflows across departments to get the assets in the required format to the customer. The CMS is being made more cost effective by adopting cloud technologies to do away with extra software and installations. The tipping point is on for more integration with huge data companies to garner vital statistics on consumer behavior and feedback, and project products accordingly. As a prelude to CIO Review’s Enterprise Content Management solution providers, our selection panel evaluated the capabilities of dozens of promising vendors in the Content Management space to power onward the study on consumer behavior across channels, devices and platforms to tailor-make engaging customer experience. We present to you CIO Review’s Most Promising Content Management Solution Providers 2014. ANVATO Provides integrated TV platform solutions. Endavo Provides an OTT video services platform that enables delivery of commercial multi-screen video services. Metrix Systems Producer of in-depth SaaS software suite for e-commerce, video on demand (VOD), ERP, live streaming monetization, web development platform and CMS systems. Mirror Image Scalable online services for companies worldwide. Niche Video Media Provides a cost effective secured streaming video platform. 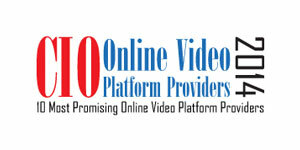 Ooyala Provides products and services for online video technology. The Trade Desk Offers agencies, aggregators, and their advertisers a demand-side platform to manage display, social, and video advertising campaigns. Visual Unity Helps clients deploy their assets across multiple devices, screens and media formats. Vubiquity Provider of multiplatform video services.